I've been asked to design a course that will ask participants to take quizzes, and then collect the results for us to use as data. There's no "passing" or "failing" this course, we just want to collect the information they enter. Is there a way to do that without having an LMS or using Articulate Online? Quizmaker is designed primarily as an elearning development tool to be used in conjunction with Articulate Online or your own Learning Management System (LMS). 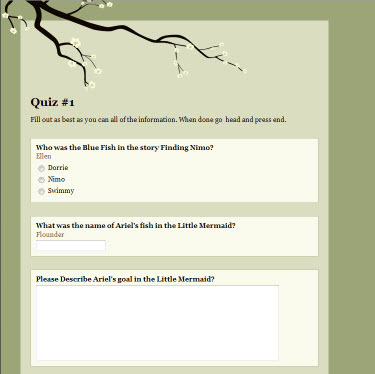 You can track and report quiz and survey results via stand-alone Quizmaker quizzes or those embedded in Articulate Presenter using a number of methods. Although email is not intended as a robust tracking mechanism, Quizmaker does provide an option for emailing results. Upon completion of a quiz, the user can choose to email the results to a designated email address. The results are sent in raw text format in the body of an email (raw text is the most flexible and universal data format). The recipient can then copy and paste the comma-separated output from the email into a text file and open it via Excel. After importing into Excel, you can select a "Table" format to organize the data into columns for better analysis. If you don't want to do what Brian suggests, create a Google form. They tie directly to Google Docs spreadsheet. Here is an example Lickert test I created for an e-learning course. If that's all you want, Google Docs should work. Plus you have all of your data in a down loadable excel spreadsheet format. 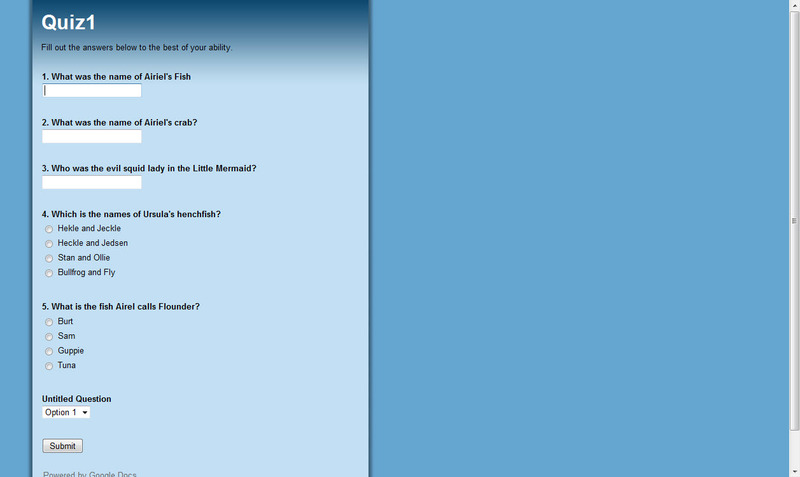 James, so you don't use quizzmaker at all for this? You embed a google form, correct? I'm afraid what I'm looking for is what Brian said was not supported, to track results using a text or .csv file. Actually I just had a link for the users to go to. Then they fill out the form which updates my Google Doc. Then I simply download the answers as a .csv, text, pdf, etc. Then you can do whatever you like with the data. Make graphs, charts, spreadsheets from the data. Based on what you are saying this will do exactly what you want. Survey Monkey would be another recommendation. KISS -- Keep It Simple Silly..
BTW - there is a timestamp on the form for each record so I know the date and time the user took the quiz. I am sure my question isn't worth a new topic so I post it here. I followed this excellent tutorial http://www.articulate.com/forums/articulate-quizmaker/8169-articulate-09-email-results-tutorial-php.html to get test results without LMS. Everything works well except that encoding in plain text that is sent to e-mail adress is very strange. I can not convert it in anything readable when importing in Excel. I use cyrillic (Russian). Is it possible to turn the output in Cyrillic(Windows)? In which file (and where) encoding is set? if you want to do this all within Storyline, you can. We can save any data in an SL variable, to a database. And from there to a spreadsheet, giving you the flexibility of the SL environment at the front end and complete control of the data at the backend. let me know / sned me a PM if you want more info. 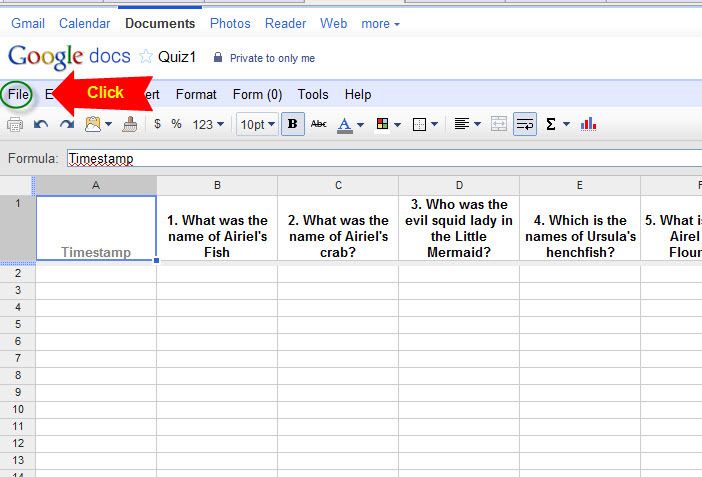 I am very interested in learning how to remain in SL environment and send quiz results to a spreadsheet. I am totally unfamiliar with SL variables. Do you have a step-by-step process you could share? I've been searching for a way to get survey results without having to go throught the LMS.I have SL2 now - can you tell me if your method works in SL2 and is it possible to share how? I realise your post was a year ago, but hope I'm in luck. I'm not sure that Paul is still subscribed, so you may want to use the "contact me" button on his profile to reach out to him directly. Any chance of sending me a step by step guide on how to do this? This thread is a bit dated and I'm not sure that John is still subscribed. You are welcome to reach out to the user directly via the 'Contact Me' option on the user profile if you wish. A lot of the links to conversation threads seem to be broken now that 360 has been introduced. Any idea why? Hello, All of the links in this thread appear to be broken. Thanks for looking into these! The others were unverified/unsupported ideas shared and from 6 years ago and do not have new links re-directing to the older solutions/archived forums. Can you let us know the difficulty you are having and we can certainly try to assist? "Hi Jameela! This thread is a bit dated and I'm not sure that John ..."
"Kate, if you want to do this all within Storyline, you can. We can ..."
"Hello! I am sure my question isn't worth a new topic so I post it ..."